Over the course of my dissertation fieldwork in Mongolia, I spent a considerable amount of time ‘doing the rounds’ with the bagiin darga (rural district supervisor) of district 1 in Olziit sum, Bayanhongor province in central west Mongolia. ‘Doing the rounds’ consisted of traveling to each herder household with a variety of objectives depending on the season, such as buying sheep wool, issuing livestock insurance, counting livestock numbers, administering national household surveys, traveling with vets or doctors, etc. In my field sites in rural Bayanhongor, I observed an active state presence in herder’s personal lives in both the district and provincial level and was often struck by the frequency of contact between government representatives and herding households. Over the course of my time in the field from May 2013 – January 2014, I observed a set of practices initiated by the state that I consider to be part of an ongoing process of formalizing and commercializing the household production of rural mobile pastoralists in Mongolia. My experience is somewhat at odds with the portrayal of an absent or dysfunctional state administration in rural Mongolia; rather, the state seems to be actively involved in shaping the production strategies of herders and the nature of their citizenship. The individually packaged red stamps were distributed to herders along with a diploma and medal. The stamps have the name and registration number of a head of household on the face to be used during economic transactions such as the selling of fiber or meat products. For this entry, I would like to focus on one initiative in which I was an active participant. About a week before the presidential election in June 2013, I accompanied the bagiin darga (district administrator) and two others as they distributed three objects to each herder household in my field site in Olziit sum. 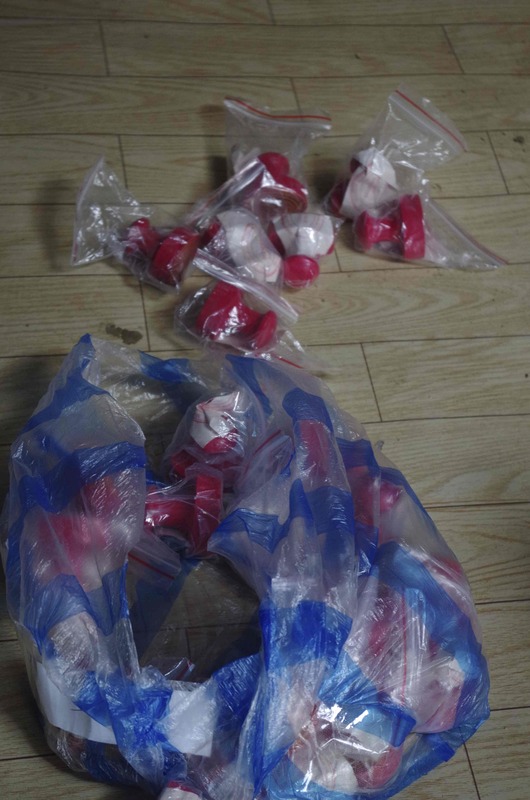 I actively assisted them in this process and documented the families as they received these objects. The objects were: an official diploma for herders, which was presented in an red folder with the diploma title ‘Mongolian National Herder Diploma’ (Монгол улсын малчин үнэмлэх) embossed in gold letters on the cover, a medal titled ‘Mongolian National Herder’ (Монгол улсын малчин), and a red colored personalized official stamp (тамга) with the name of head of the household and registration number carved into its oval rubber shape. This photo features the heads of household with their diplomas and medals. At the bottom of the left side are the seals and signatures of the Ministers of the Department of Labor and the Department for Agriculture. “This is to certify that Sangi Ochir Monkhbat is carrying out and maintaining the traditional practices of animal husbandry of which he has mastered and for which he knows the knowledge and methods.” Following this statement is a bullet list of thirteen points summarizing the knowledge and skills that comprise the work of a herder. The day that we were distributing diplomas, this man’s relatives were preparing food and setting up a new ger for a wedding. I learned a few months later that the young man who was married subsequently got in a motorcycle accident during the wedding festivities and now can barely write his name and walk. These diplomas were distributed to the male and female heads of households along with a medal featuring the title “Mongolian National Herder” with the five types of livestock in an inverted V shape with the horse at the pinnacle. As we distributed these items, the bagiin darga jokingly said to the herders, “Now you have a profession, congratulations.” As we traveled over the alternatively sandy and rocky dirt roads of the district, the bagiin darga would tell me the name of the next family that we were going to visit and I would locate their individually wrapped and labeled stamp from a flimsy blue and white plastic bag, tearing at the seams and jammed up on the shelf above the dusty seat of our tough Honda excel. When we arrived at a household, we would sit down for the customary tea and taste from their hospitality plate and the darga would explain the purpose of the visit. Then he would gesture for one of us to give the diploma, medal, and stamp to the heads of household. 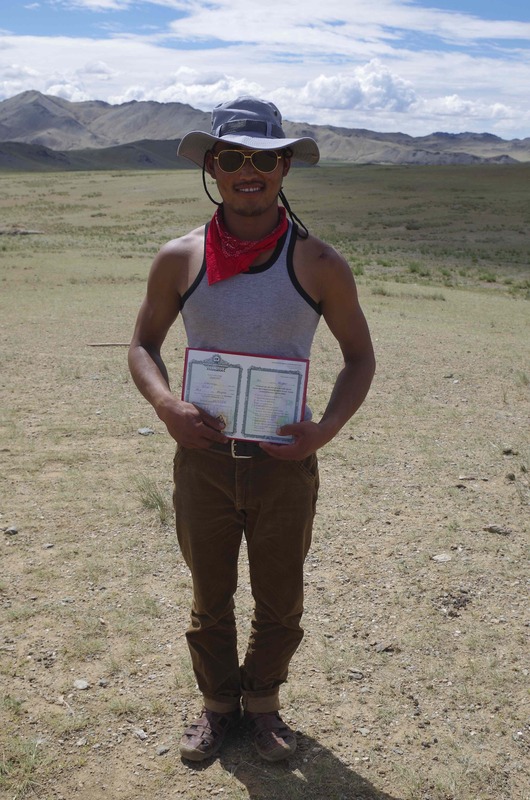 Depending on the household and our timing, I would snap a few photos of the herders with their certificates. These items were being distributed to every fulltime herding family regardless of age. A few of the families were quite elderly and others received the diplomas with infants and young children looking on. Many families asked what they were supposed to do with the stamp, and the bagiin darga explained that it was to be used when they sold their produce, especially wool and cashmere. The process is especially interesting if looked at vis-à-vis the efforts that herders are making to ensure that their children participate in formal school-based education in rural and provincial centers. My colleague, Dr. Bumochir Dulam and I, found that herders in Northern Bayanhongor province invest a considerable amount of their wealth generated from livestock produce as well as resources such as time and social capital to provide school-based education to their children. Over the course of my time in Mongolia, herders constantly referred to themselves as “unskilled” or “uneducated,” and used the Mongolian term “мэргэжилгүй,” which translates as “without a profession or unskilled” to describe themselves. I have heard these terms used frequently in Ulaanbaatar as well and they seem to comprise a general discourse on herders as formally uneducated and unskilled individuals. Formal education, in many ways, seems to be the primary quality that many Mongolians I talked to used to differentiate herders/rural work from non-herders/non-rural work. I spent the day distributing diplomas with the district ‘boss,’ Luvsantseren. A herder walked us to an area with cell phone service, and one of our company tried to capture a bar or two. In this context, the government initiative to distribute diplomas to herders appears to be a way to formally acknowledge and value the work of mobile pastoralists as a valid profession with a set of skills that contribute to the idea of the Mongolian nation. The idea that herders play an essential role in maintaining the traditional culture and environment of Mongolia is listed in the bulleted list of herder skills highlighted on the diploma. All three objects include the term “Mongolian National Herder” which emphasizes the role of the herder in a national project. Although these objects invoke the socialist past (the red color, the symbolic qualities of a medal and a stamp), the type of citizenship that they put forth is one based on an entirely different logic of production and political participation. This logic includes a discourse of personal responsibility and initiative, which I observed the Bayanhongor administration use multiple times with herders in a variety of formats (from sum meetings, conversations, speeches by the provincial governor, to a “relationship” notebook that is kept in the herder ger as a way to communicate with state representatives). It is interesting to see how the distribution of these materials is playing out. In August, I visited Gurvanbulag sum, which is about 240 km north of the Bayanhongor aimag center and my primary field site of Olziit sum. (I did not take part in the distribution of the diplomas in this area). As I was talking to an older herder in his late 50s, an active and vocal member of the community who often presents long critiques of government initiatives during sum meetings, he stood up to show me the long banner of medals hanging from the north side of his ger. He explained many of them to me, but stopped at the recently distributed Mongolian National Herder medal, a shiny piece at the end of a long display of tarnished socialist awards, to say that it is the medal that he is most proud of. He removed it from the banner and held it up to emphasize that this medal was the most important of them all, and in comparison the rest did not matter. On the other hand, some herders appear to be a bit ambivalent towards the diploma. The bagiin darga himself awarded me with a diploma and issued me a registration number for his district in what appeared to be a humorous act of everyday resistance. Why is the State Making Its Presence Felt in the Countryside? The herders registered in the first district of Olziit sum of Bayanhongor aimag were given a “National Herder of Mongolia” diploma and medal. How can we understand these state initiatives? Is this simply a tactic to gain more votes? Is it an initiative to be more inclusive of rural society by encouraging participation after economic collapse and the rapid post-socialist privatization of the 1990s rendered the paternal state largely absent and ineffective? The overt economic quality of these initiatives, especially in the context of Bayanhongor’s effort to revitalize its sums with funding from the World Bank, calls attention to the larger development project that the Mongolian state is carrying out. These initiatives are occurring alongside the privatization of winter and spring camps and the increasing reliance of herders on annual bank loans to finance their household (education, household expenditures, health care, livestock care). To gain further insight on how these measures might play out in Mongolia, it might be useful to look at places in Africa and Chile and the development model of value-chain driven agriculture playing out among smallholding farmers. Phil McMichael’s 2013 piece in Third World Quarterly titled “Value Chain Agriculture and Debt Relations: Contradictory Outcomes,” provides a potential starting point for looking at how the Mongolian state is moving toward managing the agricultural sector. One aspect of this model is the focus on ‘Mongolian made” fiber products, which encourages herders to sell their fiber to the local government rather than Chinese traders. The bagiin darga, who referred to himself not as a “boss” but as a servant of both the government and the district herding community, explained that prior to the government purchasing of sheep wool from herders, locally produced wool would go directly to China. He sees the government purchasing initiative as being more systematized and reliable, and contributing at least superficially to Mongolian economic and cultural sovereignty. Contrary to an absent state in rural Bayanhongor, I observed a local administration that was very involved in managing herder affairs with frequent contact via sum meetings, phone conversations, and home visits. Government representatives are often active, absentee or former herders and play multiple roles in the community. The paternal state of the past may have given birth to a commercial one, and there needs to be more research focusing on how its institutions manifest within household units and are influencing the nature of citizenship. The formalization of household herding though the distribution of diplomas should be seen as part of this wider process of governance and the changing nature of rural work in Mongolia. Ariell Ahearn is currently a Ph.D. candidate in the School for Environment and Geography at Oxford University, where she is working on an ethnography of changing rural work practices among semi-nomadic herders in central-west Mongolia. 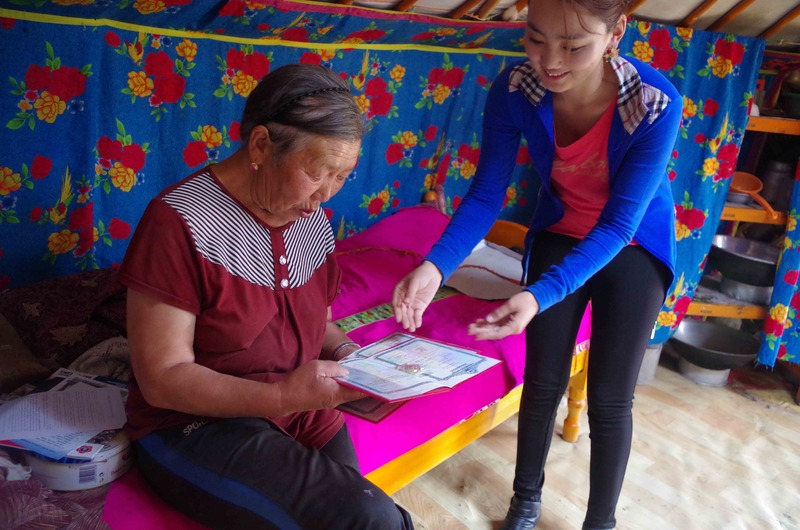 She spent the last year working and living with herders in order to understand the conditions for practicing nomadic pastoralism in her field sites located in the region of Northern Bayanhongor province. Originally from rural upstate New York, Ariell is passionate about rural livelihoods, local knowledge, and livestock husbandry as it is practiced around the world. This entry was posted in Ariell Ahearn, Countryside, Education, Nomadism, Presidential 2013, Research on Mongolia. Bookmark the permalink. 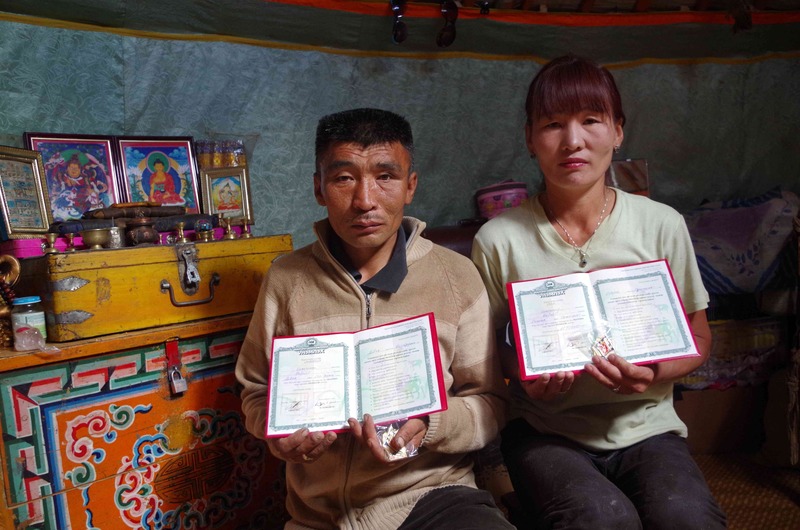 Were the herders’ diplomas distributed throughout rural Mongolia to every malchin household?